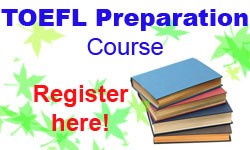 How good is your TOEFL score? 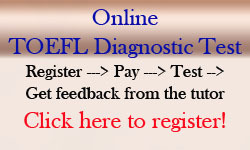 Let's do TOEFL Diagnostic Test to discover your TOEFL level before taking a TOEFL Course. Get the brightest star! Improve your English level with us. You need better TOEFL score for university requirement, landing a better job etc, we are here for you! Got no time to go to English Course? Join our English by phone! You still can learn English and rehearse your conversation only using your mobile phone. 4. Ray’s been trying to keep a lid on his emotions, but every now and then his anger erupts. When we got to our holiday destination, it was a very long climb up to the cottage that we were renting. John thought nothing of it but I found it quite difficult. However, when we got to the top, the view was so beautiful that it brought a lump to my throat. We were only going to be there for two weeks, so we were determined to make the most of it. Then my mother rang to say that my grandmother had been taken ill and her life was hanging in the balance. Of course, everything else faded/paled into insignificance then and we agreed that we wouldn’t dream of staying away in those circumstances. We caught the next plane home and spent the flight trying to come to terms with the thought that she might die. However, thank goodness, when we got to the hospital, she was sitting up completely recovered and very apologetic that she had spoiled our holiday. In these conversations, the second speaker uses an idiom to repeat and sum up what the first speaker says. Sam : Yes, it really was out of this world, wasn’t it? Sam : Yes,he’s second to none, isn’t he ? Sam : Yes, he’s a hard act to follow! Sam : Yes, it’s just made for this room, isn’t it ? Sam : Yes, he gave as good as he got, didn’t he ? Rose : Yes, they’re like gold dust. Ted : Yes, he’s done some really ground-breaking work. Read Alice’s account of some problems she had with a colleague at work. Note the idioms. Parents who don’t control their children have a lot to answer for. That restaurant is not all it’s cracked up to be. Her spoken English leaves a lot to be desired. This bottle opener’s a dead loss. It means : crude and lacking sophistication. Then you say : Thanks a million ! Did you get the job you wanted ? Then you say : No such luck ! Can I go skiing with you and your friends this weekend? Then you say : You can say that again! Come on the roller coaster with me ! Then you say : No way ! Then you say : There’s nothing to it! Then you say : Don’t make me laugh! Then you say : How time flies ! If someone says : What do you think caused the problem? If someone says : Who do you think is to blame – the boss or the workers? What do you think of Tom Cruise’s acting ?